Bumkins' Grip Dish is great for little ones learning to self-feed, or more experienced eaters using utensils. This divided plate is perfectly sized for toddler portions. The straight edge allows kids to belly up to the plate, causing less mess. 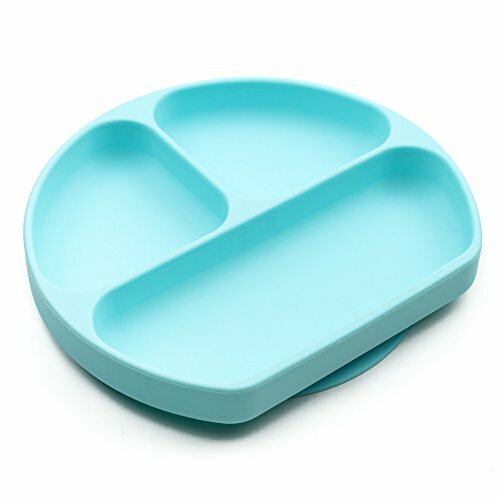 The safe, BPA free, lead free, phthalate free, food grade silicone makes this dish easy to clean, you can either hand wash it or put it straight in the dishwasher. It is also durable, stain resistant, and doesn't harbor bacteria. The strong suction grip ensures the dish stays put, even with the most aggressive toddler. It fits most high chair trays, measuring approximately 8" across, 7" tall, and 1" deep. Silicone is heat resistant and can be safely used in the microwave or oven. Always test food temperatures before feeding baby. Designed in Arizona, made responsibly in China.